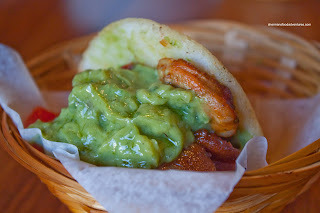 Over a month ago, I quickly did a same-day post about my meal at Mis Trucos. Was it because the food blew me away and I just had to write about it quickly? Well, not really. Although the food was not bad, that was not my inspiration. Rather, it was the playoff series with Chicago that got me going. Believe it or not, Viv and I were at dinner missing out on Game 6. Turns out that I got home in time to see the Canucks lose in OT. That capped off 2 blowout loses including the game prior. They did come back to win Game 7 in dramatic fashion thanks to Alex Burrows. Now here we are in the Stanley Cup Finals and after building a 2 games to n one lead, the Canucks got their lunch handed to them via an 8-1 drubbing. No matter, it's only one game. A loss is a loss. Now, it is time to move on. I have confidence that they will return to their winning ways and that is why I had to post this in a relatively expeditious manner (however, they go on to lose again 4-0 in game 4... deja vu anyone?). Therefore, this post had to go up now since I really don't want to talk about this when the playoffs are already over! So, after the depressing loss, Bear, Milhouse, Emilicious and Hot Chocolate met up with me at Latitude for some after game eats. It was normally our softball night and we've been so conditioned to eat out afterwards, there is always and empty feeling if we don't. We ended up at Latitude since it was somewhat central to everyone and it wasn't Asian. Yah, we're a bit tired of the Asian food thing; but that is almost an inevitability in Vancouver. There really are so many more Asian food options compared to everything else. 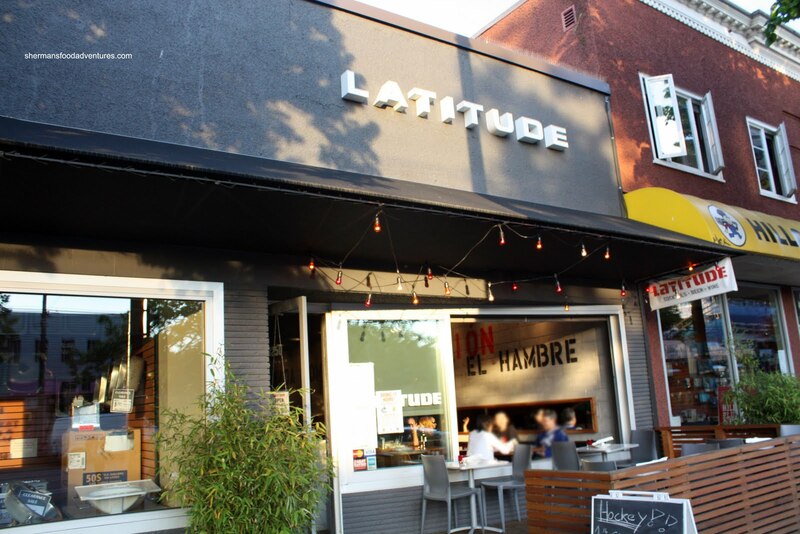 Somewhat removed from all the "action" along Main Street, Latitude serves up mainly Latin-inspired food in a hip dining space. 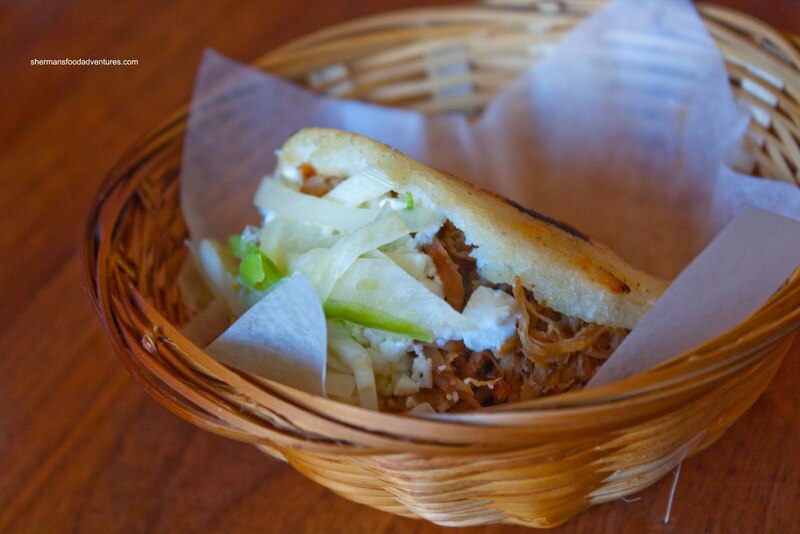 We decided to mostly share everything except for the Arepas, which are small round white corn pockets filled with choice of ingredients. Not conducive to sharing, we ended up having one each. I went for the Chorizo with avocado and confit tomatoes. This was a messy proposition. Everything was falling and dripping out. I didn't mind though, it had a nice kick from the meaty chorizo and a cooling effect from the smooth avocado and tart tomatoes. I found the corn "pancake" to be dense while still easy to eat and crisp on the outside. Emilicious had the Wild Prawns with arugula and smoked paprika mayo. 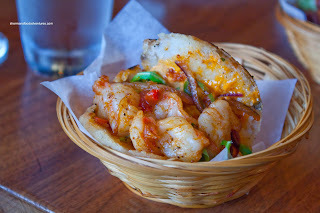 It was bursting with crunchy prawns and mayo which made it as messy as my arepas. She really liked the smokiness and thought everything worked well together. 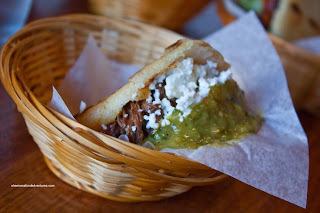 Milhouse and Bear both had the Braised Beef with black bean, queso blanco and tomatillo salsa. They seemed to like it; but didn't say much about them. Hot Chocolate had the Smokey Pulled Pork with feta, pickled fennel and jalapeno. She as well thought it was pretty good with a good combination of flavours. 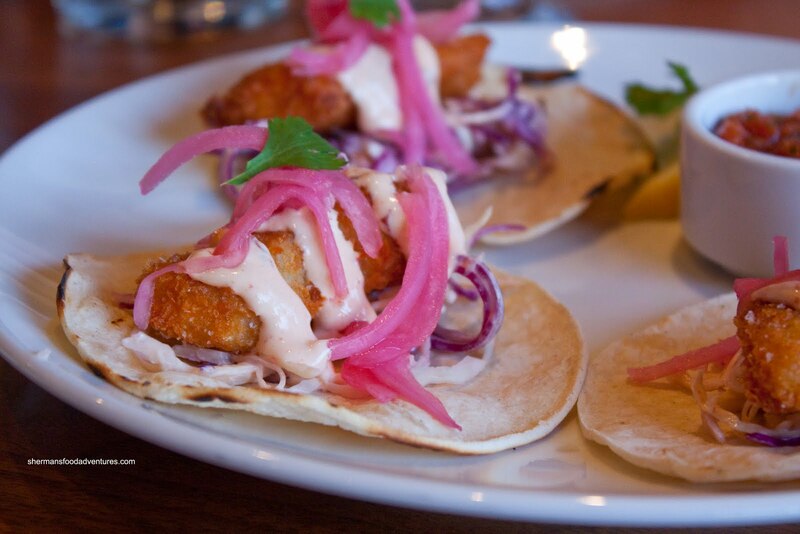 After the arepas, we shared a few items starting with the Baja Fish Tacos served with cabbage, chipotle creama, pickled sweet onion and red salsa. I really like the fact the fish was fried rather than being grilled. This way, the taco was much less wet and the crispiness of the fish added texture. Personally, I would've liked more heat in the taco; but in the end, it was flavourful enough with the pickled onions. 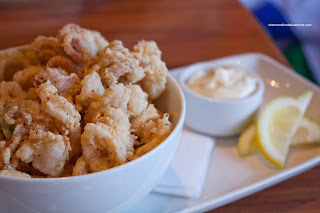 Next up was the Calamares which was served with a citrus aioli. The squid was fried pefectly with a light crisp exterior while being tender on the inside. The batter itself was quite mild while the aioli didn't add much in the way of flavour. For me at least, it went so much better with the smoked paprika mayo that accompanied the Chickpea Fries. The flavour of the paprika mayo was more intense and impactful, which in my opinion helped with the flavour-challenged calamari. The chickpea fries themselves were not as crispy as I would've imagined. Rather, they were "cardboard-like". Personally, that was a texture that I did not enjoy; but again, chickpeas have their limitations as to their texture. I did find the inside to be quite good though. It was well-seasoned and fluffy. We also shared the Chicken Wings "Anillo de Fuego" because it was on special. Hey, we'd never pass up a daily special! Initially, we were expecting hot wings and nothing else; but we were pleasantly surprised that their house hot sauce which was quite good. 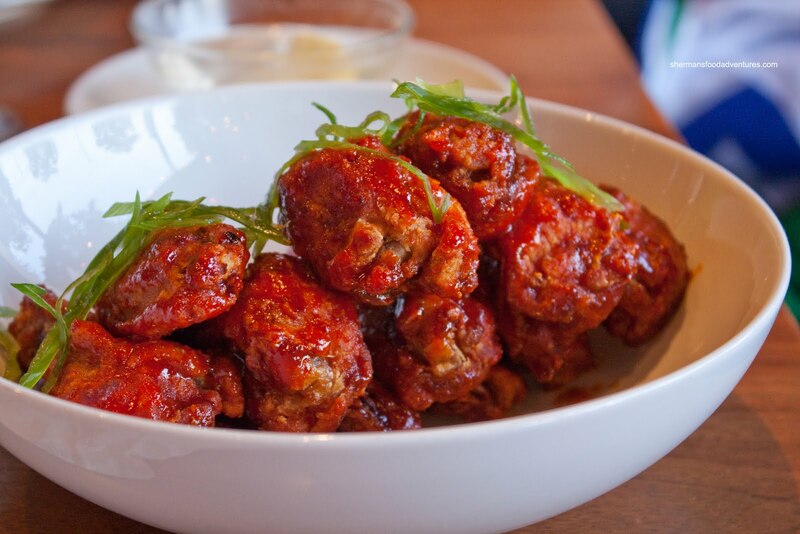 There was a nice balance of smoky, sweet and tang which really amped up the perfectly fried chicken wings. And about those chicken wings, they were big, moist and juicy. There were 12 of them and it sure looked more than 1 pound. Strangely, a few nights prior, we had "1 pound" of wings and there were only 8 (and roughly the same size too) at the Thirsty Penguin. 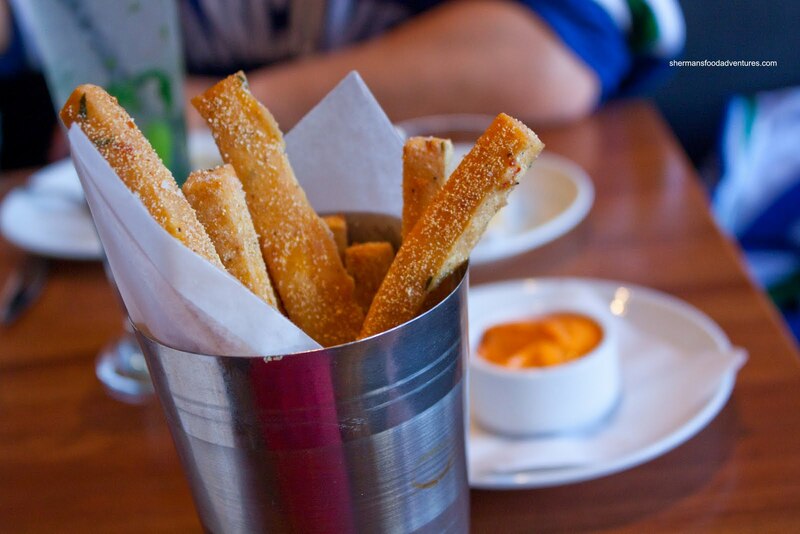 After all the appies, we shared 2 entrees. The first was the Boneless Beef Shortrib served with Colombian papas chorreados and onion gravy. 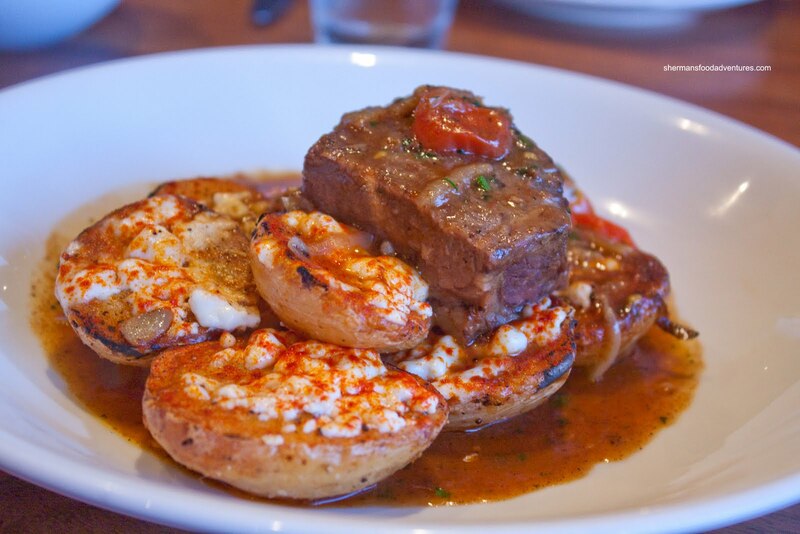 Despite being fork tender, the shortrib was dry and stringy. It was okay still. Just not as moist as we expected. The gravy was alright. I found it to be slightly sweet with only a modest amount of salt. This was a very mild tasting dish. The papas were pretty good being super soft on the inside while nicely roasted on the outside. Interestingly, we could all see the cheese on the potato; but it didn't have much of an impact. An okay plate of food, if not unmemorable. 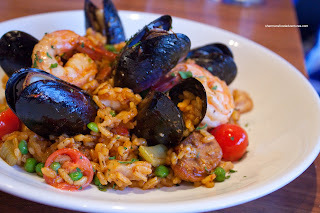 Lastly, we had the Paella de Mariscos consisting of smoky tomato saffron arborio stew, prawns, mussels, fish and chorizo. We found the rice to be slightly overcooked; but it wasn't short on flavour. Plenty of smoky and savouriness from the chorizo with a touch of the sea. We didn't detect any strong saffron essence though. For $20.00, we felt this was a tad expensive considering the size of the dish (although it did have a decent amount of ingredients). By virtue of having Bear at the table, he exerted his sphere of influence which resulted in Emilicious and I sharing an order of Tres Leches Cake. As the name suggests, it is cake that is soaked in 3 types of milk - evaporated, condensed and cream. We both thought this cake was a winner. Prepared correctly, the cake was not soggy despite the generous soaking of milk. It had a nice consistency and texture while being only slightly sweet due to the condensed milk. 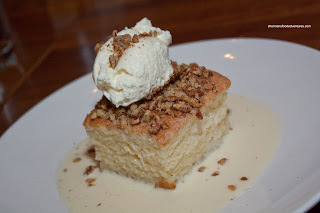 However, what really put the cake over the top was the smashed candied walnuts. It added another layer of flavour as well as a crunch. Good textural and flavour contrast. 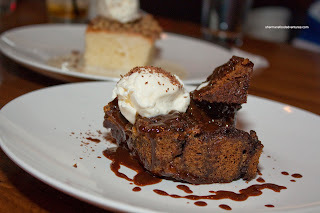 Milhouse and Bear ended up ordering the same dessert being the Chocolate Banana Bread Pudding. Man, they make it hard for me! Ordering the same thing again!!! Anyways, I gave the bread pudding a try and I found it to be rather dry. Furthermore, I didn't get much in the way of banana. In fact, the chocolate flavour was not really all that intense either. At the very least, that resulted in a modestly sweet dessert, which I prefer. Although I really liked the Tres Leches Cake much more. Overall, it was a fairly decent meal at relatively reasonable prices. As always, there were some highlights and some not so memorable items. That's normal for any restaurant. 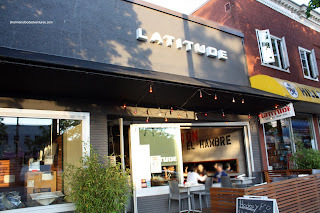 Latitude is a decent option for late night eats and drinks along Main Street. Maybe we all need a drink after the the back-to-back deja vu loses to Boston. Hey, they came back to win the Chicago series, so you never know. Keep the faith, that's all we can do anyways. Hi Sherman. I would really recommend you try their brunch. Their Latin-egg dishes are tasty and their tres leches french toast is a winner. I haven't had dinner here in ages -- thanks for the write-up! Another reason why I don't trust "latin-fusion" restaurants: "Colombian papas chorreados"...it should be chorreadas not chorreados. Yes, it is a small mistake made in their menu, but if you cannot spell correctly the few spanish words that you have in the menu how can one really trust this place (if one is latino). And btw, those potatoes look horrible in comparison to what they typically look. And yes, I'm being picky. 3) Main Street Pilsner (Doméstico) vs Mexico/Peru/Daiquiri/Cócteles/etc. And I won't use that excuse for not "trusting" a restaurant. Have you ever been to a Chinese restaurant? Have you seen their translation? In fact, the joke is that, if the spelling is correct, THEN I will suspect there is something wrong! Regardless of whether the food is good or bad, you have to take it for what it is and where you are. You can't compare it to traditional/local cuisine because you can get the same ingredients and, at times, you can't build the same infrastructure to serve them. And, in the case of places like here in Vancouver, where there is no such demand, you have to tailor it to the (mis)conception of what believe is the real thing. To be honest with you, I didn't read the whole menu in order to find more spelling mistakes. I guess I should have checked all of them (as you did) and for that I apologize. I do believe, that if in a restaurant they are going to add sentences/words in another language they should do their homework and try to write them correctly. Otherwise, those that speak that language will find it funny (or even offensive) and lose trust in the restaurant. Now, I agree with you 100% that it is hard to compare "traditional" dishes since the places and corresponding ingredients change dramatically. However, "papas chorreadas" have: potatoes (red), tomatoes, green onions, white onions, chicken stock, butter, cilantro, cheese (usually "queso campesino" but mozzarella is a good enough substitution), and "color" (or ground achiote). All of the above ingredients except "color" are easily found in Vancouver; in fact, even achiote can be now found in some "latin" stores in East-Van/Burnaby/Coquitlam. And to be honest with you, a little bit of "color" doesn't add much flavor to the potatoes, just colour. That's why I believe that there is no excuse to do a dish totally differently if the ingredients can be found here in order to make the dish as close to the original as possible. Of course, one may argue that the restaurant is "latin-fusion", so one cannot be too strict or literal about things. But in my mind, if I call something "cheeseburger" I'm expecting something like a "cheeseburger", possible with one or two differences, but still a "cheeseburger" (for example). Now...you could also claim that I'm just a Latino that misses his "comida de la tierrita" way too much and is stupidly picky about it...which would make everything that I wrote before a bunch of BS (...which could be true). @Jordan Thanks for the tip! @Anonymous & @KimHo Well, we all have our own tastes and no one has the right to say we can't have them. Fusion or unauthentic food does offend some people. It sometimes irks me too. However, Kim is right by saying that we have the restaurants that we have based on the "majority" of diners. So, a restaurant is not out to please a select few who demand and expect authenticity. Restaurants are in the business of making money. Hence, they will provide what would appeal to "most" people. That's why some Thai/Szechuan/Indian restaurants do not make authentic versions of their dishes. Not everyone can stand the heat or the spices involved. That irks me as well honestly; but I understand that they do what it takes to stay in business. I have spoken to many restaurant owners and they have tried to be more authentic; but those dishes end up being duds and no one orders them. Again, it brings back to the point - the restaurants we get are the ones we deserve. Not everyone can be discerning eaters nor are they interested. The bottom line is if the food tastes good to someone, it doesn't matter how authentic it is. And the restaurants know that and appeal to the majority of eaters that way. Lastly, I had a friend who is African-Canadian. She attempted to do authentic "Soul Food" for a dinner. Sure, it might be easy for some people to say they can acquire green tomatoes, collard greens and so forth. Yah, I've seen it around. But she called around everywhere and couldn't find any. Green tomatoes could be found during July at a farm market in Richmond. Problem being, it was not July. Now if you look at a restaurant and wonder why they are not using "authentic" ingredients, it is because the food supply companies locally just don't carry some of that stuff. By being available at market XYZ in Vancouver is not sufficient. Is it consistently available? Is it of good quality all the time? Is there enough of it? Can the restaurant use that as a supplier? In discussion with some ethnic restaurant owners in town, they actually have to import their own ingredients just to make it "authentic". Even that, they cannot guarantee it all the time. I'm not trying to discredit what you have said because it is still holds true. I'm only suggesting that it isn't as simple as you have explained. @ Sherman and KimHo. I agree with everything you guys said, especially regarding the lack of original ingredients for very specific cuisines (e.g., caribean, asian, latinamerican, etc.). However, my complain regarding the "papas chorreadas" is that it is so EASY to make and all the ingredients (even the "color") can be found right here in Vancouver. The color or achiote can be found in various stores and in fact, must Mexican restaurants here (Don Guacamoles, La Taqueria, etc.) already use achiote in even greater quantities than what that potato dish uses (you probably don't need more than a table spoon or two for 15 to 20 servings of the potatoes). Thus, I still believe that the excuse that applies to pretty much ever single restaurant trying to make food from other countries does not apply to that specific dish...why? because all the ingredients are found here (during the whole year) and the dish is very simple and does not represent any "weird" flavours or lots of "hot spices" (Colombian food doesn't use much heat/"hot spices" at all). My comments are based just on the potato dish, since is the one that I've been eating since I was a toddler and know how to make it pretty much by heart. I agree that for other dishes the "authenticity" factor is different due to the reasons that you guys stated above. I'm sorry if my comments created issues here. I'm actually surprised they did...I was just discussing spelling mistakes in the menu (which I still think should be fixed) and the potato dish. I didn't want to generalize the issues with the potato dish with every single item in an ethnic restaurant. @Anonymous Oh, don't worry about it. No one is upset or anything. It is good to have such discussions. For me at least, these discussions have both taught me new things and have opened my eyes to all points of view. I do understand the comment about the potatoes because I have a similar reaction to some interpretations of Chinese food. Believe me. It irks me when I am presented with something that is not remotely close to what I grew up eating. But for me at least, I accept it for what it is because restaurants do what they do. The only thing I can do is not return to eat there (which are many!). Getting back to the potatoes, strangely enough, I've had a better version of them before and yes, these were bland, as I mentioned. But then again, we went in with the attitude that they were just roasted potatoes with some cheese on top. Just like I have to go in with an attitude that an Oyako-Don at a Korean-run Japanese restaurant will have things like sprouts, broccoli and stuff that doesn't belong. It's not an Oyako-Don, it's a bowl of rice with stuff on top. C'est la Vie!